The new twin railway tube will run from the municipality of Ski in the south of Oslo right into the center of the metropolis. Thanks to the high advance rates of the double shield technology, all tunneling work can be managed and carried out from one large central jobsite. The final double breakthrough of the two Herrenknecht tunnel boring machines “Anna” and “Magda” (Double Shield TBM, 9.9 m OD) in the Norwegian town of Ski completed the excavation of both 20-km long tunnel tubes of the Follo Line railway. This concludes the tunneling work on what is currently the country’s largest infrastructure project. The first two Herrenknecht TBMs, “Queen Eufemia” and “Queen Ellisiv,” had already reached their destination in Oslo on Sept. 11, 2018. 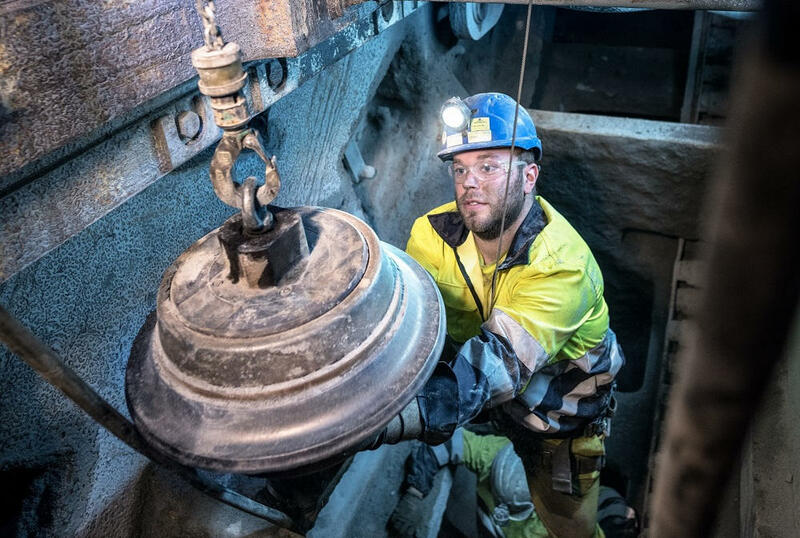 The miners and the 350 invited guests cheered loudly when, on the afternoon of Feb. 26, 2019, the sister machines cracked the last few centimeters of hard Norwegian rock with maximum precision after they had worked their way through it for about 9 km each. “Anna” and “Magda” had been chewing through extremely hard Norwegian gneiss since autumn 2016. This successful completion of the project represents an important milestone for tunnel boring machines in a country that has so far been relying primarily on conventional drill-and-blast tunneling. With drill-and-blast it would have taken a total of seven construction sites in the metropolitan area, some of them difficult for trucks to access, which would have placed a great burden on traffic and residents. In contrast, the TBM solution gets by with only one central point of attack. Two 900-m long access tunnels connect the large Åsland jobsite on the surface with two underground caverns. From there, two machines each bore south and north respectively to create the two tunnel tubes. Kalager is expecting the Follo Line to act as a signal for further projects in Norway. Acciona Ghella JV is commissioned by the Norwegian government’s agency for railway services (Bane NOR) to construct the main part of the tunnel at the Follo Line. As of late 2022, high-speed trains are to drive through the new tunnel tubes at speeds of up to 250 km per hour, halving the travel time between Oslo and of Ski 22 km to the south from 22 to 11 minutes. The Follo Line represents a lifeline for the future of the Norwegian capital with its population of 600,000 and the region around Ski, which anticipates population growth of 30 percent by 2025. Regular maintenance and repair of the machines and their components are a prerequisite for consistently high advance rates in the complex Norwegian hard rock. To master the extremely hard rock with up to 300 MPa compressive strength, Double Shield TBMs by Herrenknecht were employed. The sophisticated tunnel boring machines combine the functional principles of Gripper and Single Shield TBM in one machine. They can simultaneously bore and line the freshly bored tunnel with rings made of reinforced concrete segments – 140,000 of these segments were placed during the Follo Line Project. The advance stands and falls with the quality of the disc cutters. The disc cutters made of special steel, 19 in. in diameter and each weighing up to 372 kg, are pressed against the extremely abrasive rock with up to 32 tonnes of pressure. “The wear of the disc cutters was enormous,” stresses Matthias Flora, a specialist in hard rock at Herrenknecht. Up to 50 of Herrenknechts cutter experts in Schwanau, Germany, professionally refurbished a total of around 8,000 worn disc cutters for reuse for the four machines in Norway over the entire project period. “In close cooperation with our customers we feel our way ever closer to the optimal parameters for the disc cutters,” Flora explains about the special project challenges. “Even the tiniest improvement to the discs counts. If optimal cutter management allows us to complete just one more tunnel ring per day and machine, this ultimately adds up to put us two to three months ahead of the planned project time,” states Fernando Vara, Project Director of the Acciona Ghella JV. Thanks to regular maintenance and excellent teamwork, consistently high advance rates and peak performances of up to 155 m per week were achieved in Norway. Such advance rates can only be achieved with particularly strong and robust machines. Each of the four cutterheads weighing 265 tons was driven by 13 engines with a drive power of 4,550 kW each, which corresponds to 475 hp each.